Q: What is your background working with food? Can you tell me about your farm and what you do there? I don't really have any background in food or, for that matter, any kind of agriculture. I had always been in healthcare. I had always been in healthcare, and I've always wanted to farm, but back then, women and farming and being a city girl, ha, what are the odds of that? So, you do the school route and get a job and kids, the usual routine. We've been in business for about 16 years or thereabouts. It's a poultry farm, and it all started when my older son, Jay, brought home 12 chickens (girls as they are known today). In my growing up years, we had some friends who used to dairy up in Shawano County, and I would go up there just about every summer. I loved it; I hated to come home. I've always loved growing things and loved working with animals, so when the opportunity came that we were able to move out of the city, out to the country, I thought, "This will be great; we can have some chickens and horses..." Well, never did I ever expect for it to go as far as it has. We had moved away from the city, 20-some years ago, and we had about five acres and built a log house on the property. We had some horses, a vegetable garden, just a little homestead. One day Jay brought home 12 chickens. I was so excited. We had a little coop for them, and then we built a little bit fancier one. It had drywall, wallpaper, curtains, and flower boxes on the windows; it even had a rocking chair by the door. It was quite the coop. Eventually that coop became our logo for the business. Well, neighbors got wind that we had fresh eggs, then people at work heard about them, and little by little my little hobby grew and continued to grow. So we took some space in the horse barn and added a few more girls, and some little structures popped up here in there in the back, whatever we could do to find some space for more girls. As time progressed, I decided we should try doing a farmers' market. So we applied for a space down at the South Shore Market in Bayview. Every Saturday from May through October my mom, dad, and I would pack up coolers of eggs and head down to market. The market was open till noon, and we were always well sold out before that. So then, of course, we needed more eggs. Down went more girls. Not only did we increase girls, I thought maybe we needed to add some whole chickens to our product list. So I ordered some Cornish rock broiler chicks, and six weeks later they were ready for the butcher. So dad and I would butcher off about 20 birds on Friday, pack them on ice, and down we would go to market with fresh eggs and chickens every Saturday morning. We were teaching customers the importance of fresh quality food, and, most important, supporting a local family farm. Word of mouth spread, and before I knew it there was a restaurant calling us, asking if we could provide them with some eggs — actually we still do have that restaurant today. We just kind of grew with the business. As accounts came on we increased our production. By now I had divorced; I guess he didn't see the opportunity and potential that I saw in my hobby. I had the three kids and continued to work full-time. My Dad helped as much as he could. He too was still working almost full-time. We had girls everywhere. I had a very good friend that farmed down the road from me that has a pretty large hog operation. He had some extra barn space, so we ended up putting about 1,000 girls down at the river farm. Hogs and chickens, what a combination! As time went on, and with us having chickens everywhere, I decided it was time to do something about our situation. So in 2004 an old dairy farm not too far from where we were living at the time went up for sale. It had a little over six acres, a big dairy barn, and a few smaller barns. It was perfect. It needed work, but I saw great potential. So I sold the log house property, and the kids I moved to the new farm: four of us in a three-bedroom, one-bath old farm house. The kids thought I had fallen off the deep end, but we made it work. That is where we are still today (LOL), and even though my older son moved away for awhile, we are all back now on the same farm today. About three years ago a farm just three minutes up the road became available with 40-plus acres of land, so I purchased that. We now have some crop land for growing, which surely does help with feed cost. It's been a long journey, but I never look back to doing things differently.The only thing I wish is that I would've done it sooner, when the kids were much smaller. But as the saying goes, "There is always a reason for everything." Q: That must have been a challenge. Even then, farming or agriculture was not really considered a woman's field. No, not back then it wasn't. Most women were still behind the scenes of the farming operation. Don't get me wrong, they were just as much part of the farm as the men, but were not given much credit for the hard work they did. Q: When you started, or even now, have you faced any obstacles because you were a woman going into farming? Well, I suppose you could say that, yeah. After the divorce — not that my husband was of any great support to see my hobby grow before then — I kind of had to do everything on my own. I had my dad there, and he was definitely an inspiration and a help. I worked full-time, raised the kids, and tried to keep my dream, my passion still alive many years after that. But it's been a learning process. I knew nothing about chickens or eggs or marketing or for that matter any kind of agriculture business. I had to basically start from scratch. I did a lot of research; it was like learning a whole new way of life — and really farming is a way of life. You have to love it. It's not something that you can do for so many months out of the year and then say, "OK, then, we'll put it on the back burner until spring," especially if you have animals. It's a 24-hour, seven-day-a-week job, all the time. You need to wear many different hats in one day. Everything was done by hand back then. We used to wash, candle, and pack by hand everything, thousands of eggs. My mom was there too; we spent endless hours out in the garage, where we made a little kitchen for egg washing and packing. It was like you never saw the inside of the house, but the orders kept coming and I didn't want to say no. I guess after a while you just kind of didn't think about what you were doing; you just knew that there were orders to fill so we had to come up with another plan to increase production. I remember back in 2004 going to look at the farm. The kids knew nothing about it, neither did my parents. When I went to look at the farm, and believe me it was in rough shape, I looked around and the listing agent said, "I'll show you the house," and I said, "No, that's not necessary right now. I need to see these barns. What's in these barns? What kind of electric's in there? What kind of water system is in there?" He kind of thought I was crazy. I almost felt that I needed to plead my case that I was a single mom looking to start a poultry farm. I even went so far as to talk to the farmer who owned it. Thank goodness for that farmer who saw my enthuasim and my need to follow a passion. To this day he is a good friend and colleague. Lynn and her two boys, who are huge part of the farm. Yeah, when you sit back and think about it for a minute it has been an incredible journey. I think the biggest obstacle women or any entrepreneurs face when starting out in agriculture is you feel you always need to justify everything you do. You know what you want, you know your passion, and now you need to prove yourself. There were several people along this journey that saw my vision. From my hog farmer friend to the farmer with the farm, and most of all my banker who took a chance because he had faith in me. Still today he has become a good friend who still works with our financial needs because I never once gave him a reason not to trust in me. Most important was my dad, who never stopped encouraging me. His last words to me were, "Don't ever lose that farm that you (we) worked so hard to build just because I can't be here with you." I will never forget those words. Sometimes I think my dad thought I was absolutely crazy, especially when he came to look at the farm. He was like, "Oh my God ... What are you thinking, girl?!?!" But he never discouraged me; he always encouraged. That's something I try and instill in my kids and grandchildren today. So with the journey of proving myself I ended up buying that farm, and that is the farm that we are on today. We fixed up the old bull barn — it was a little bit smaller barn — so that we could move some of our girls to the new farm. Then work began on the big dairy barn. We renovated that, gutted out the whole barn, put up walls for coops and nests... And it worked. It worked for three, four years — and then business really took off. So at that point it was a matter of, "Alright what are we going to do? Do I continue to work and try to make a successful agricultural business or ... just stop?" So I decided that I needed to move ahead. In the meantime, after I made that decision, my dad had gotten sick with cancer, so it was a matter of sink or swim now. I didn't have his help anymore, so I quit my job totally and went and farmed full-time. I had still been working in healthcare and still had two kids at home, my job our main income. So that was a scary, scary endeavor. But we made it. Hard work and sacrifice, makes a stronger person. Right after my dad had passed away in 2007, my older son, Jay, and I made a decision that if we were going to keep the business we definitely needed to do something about this barn situation. I mean the dairy barn worked, but production was not the best. It's a dairy barn; it was never meant to be a warm barn, with decent ventilation for chickens. So we took the plunge, and in 2008 we put up our very first poultry house, which was 50 by 250 feet, enough to hold 9,000 girls. We went from 3,000 girls to 9,000 girls. And it was a challenge. There were days when I was like, "Oh my God, how am I ever, ever going to pay for all this?" But somehow, it always worked out. Always, always. Not saying it was easy. It definitely was not an easy task. By then my older son wasn't living at home anymore. He had moved away, and so he would come back and help. My other two kids were still at home. My youngest was still in school. But the two boys helped out as much as they could, and we continued on. Q: In saying you work year-round. Do you see any problems on the horizon, or are you seeing any problems now, for farmers because of climate change? It's funny you should ask that, because actually my daughter is working on her master's in Environmental management, so I hear it all the time. Q: I know it can be a touchy subject. Some people are divided on how they feel about it. What are your thoughts? Actually, I guess I really didn't think about it until this past year. We grow Cornish hens for a smokehouse in Missouri, and the weather this year was just terrible. The extreme heat that we had — and then it cooled down and then got warm again — played a major effect on the weight gain of those hens. They have 4 1/2 weeks to gain 3 1/2 pounds, and when it's hot and 90 degrees out, they don't want to eat. So yes, I think the weather patterns eventually are going to play an important role, maybe not as much on animal production but definitely crops. Now that we have obtained some land, we've got about a third of our corn that we grow, and corn's not looking real nice out here. We had the major torrential rains earlier in the summer, and then for two-plus months we didn't have a drop of rain, so I think it is. It is starting to play an important role in crop production, tremendously, and then it goes back to us animal producers who need that corn to feed our animals. It's like a vicious circle. Q: What is one of your favorite experiences in having the farm? I guess probably when we finished our first barn that we put up. Even though my dad wasn't there to see it, he would've been so proud. I often walk in there and just know that he's there, even today. It was just such a wonderful feeling of accomplishment that the boys and I are on the right track. We've got one barn, 9,000 girls, and this is going to be great. We're going to be able to supply what we need. It was just an overwhelming feeling. But, as you can guess, in 2011 research began again for an additional two more barns. That research led us to England to look at the aviary system that they use. We ended up installing that system in our new barns. Q: Who has been one of your biggest inspirations along the way? And I'm sensing your father was a big one. He was. He was never a quitter. You can accomplish anything you set your mind out to do, and to this day I instill that into my kids. My dad is gone, but my two boys have stepped in to fill his shoes. They're a huge inspiration to the farm. They're more on the technological side: "Let's work easier, mom." We have a lot of technology now at the farm that we didn’t before, and that's due to them, the younger generation. Now all of our barns are all computerized. There are computers to turn on feeders and ventilation and water and you name it we've got it down there. State of the art. Some days I fuss about all the technology, but I know it's the way of the future. Q: Is your farm certified organic? No. I don’t know about this whole organic movement thing. I was never a big fan when all of this organic stuff started. A lot of our customers will ask if we're certified organic, and I say we're not. I don't have to have somebody come in and tell me how to raise animals. Common sense is what you need to make healthy animals. Good food. Everything is organic if you want to look at it that way. I always tell our customers, "If you want to come out to the farm, look around, be my guest. We'll explain why we have things in place or why we do things the way we do things." It's not a little white picket fence, like everybody portrays a small family farm to be. We do things a certain way because it makes more sense and because we have to make a living as well. It's not a little hobby farm. And a lot of our customers are OK with that. And I think for most customers, if they know where their food comes from, what the farm looks like, how things are taken care of, it is just as good as buying the certified organic label. Product speaks for itself. If you have a good quality product, eventually they do come.And we have never really advertised. It's all been word of mouth. That and good honest business practice is how our business has grown. Q: Wow, and you're at 40 acres now, 16 years later. That's pretty incredible. Congratulations! What my ex-husband kept telling me was it was a waste of time and a ridiculous hobby — and my "ridiculous hobby" has now turned into over a million-dollar business. [Laughter] I guess passion and perseverance go a long way. If you totally believe in something, it can get accomplished. Q: Along those lines, what advice do you have for other women who might be starting a farm or for women in general pursuing a dream? They need to be serious. You just don't come home after a hard day at work one day and you're like, "I'm done with this job; I need a change," so you start a garden or something. You need to be serious. It's a lot of work. It's a lot of money, if you don’t have a farm that was passed down to you. And it's a 24-hour-a-day job. Whether it's snowing out, raining, a hundred degrees, or 20 below zero, you are out there. If you have animals, you need to be there. So it's not for the faint of heart. If you have a passion and you're serious, then follow that passion, but at some point there's no turning back because the financial aspect of it is huge. So, either you're in for the long haul or don't do it. It's not getting up in the morning, putting on your makeup and heels, a going out the door with your cup of coffee and getting in your Maserati and off you go. More like put on the jeans, flannel shirt, and work boots and hope you can stay clean from manure till noon and nothing breaks! But not for one minute would I ever trade it for a different life. 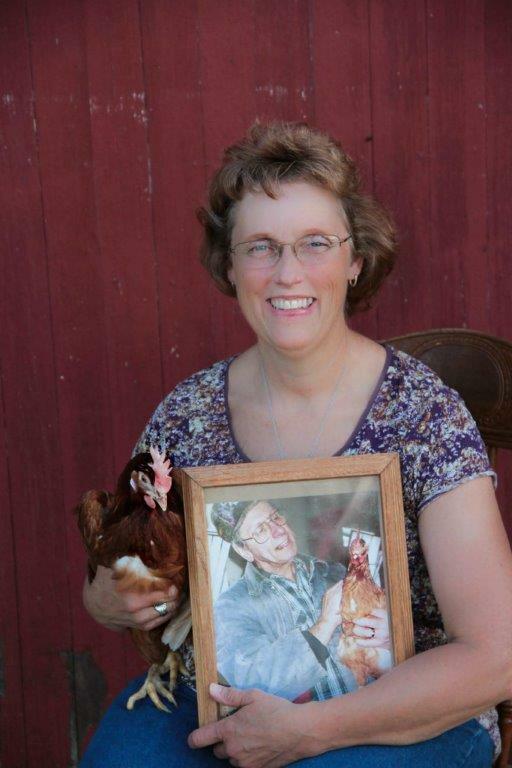 Lynn left her career in the healthcare industry and began farming with her father in 1999. She now is the owner of Yuppie Hill Farms, a 40-acre poultry farm in Burlington, WI.